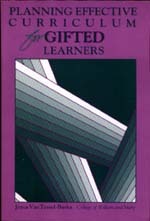 In this book the author examines both the cognitive complexity and emotional intensity of gifted children and discusses the need for modification of counseling techniques. Presented is a developmental model to enable counselors to orchestrate a program of prevention rather than remediation. Specific strategies for individual and group counseling are provided. 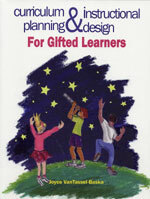 This book has checklists, forms, activities, and dozens of practical ideas for planning curriculum K–12. 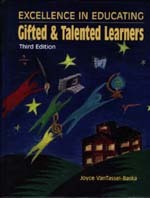 It covers strategies and management techniques plus materials and differentiated activities. Sample units are included to provide practical applications of the ideas. Disadvantaged students and learning disabled populations are covered. This comprehensive edition is packed with ideas for effective curriculum and instruction of talented learners. You'll find it covers personality, learners with disabilities, learning styles, and also stages of giftedness from infancy all the way to adulthood. It not only gives the characteristics and needs, but talks about grouping and acceleration and offers a comprehensive model of program development. Special attention is given to mathematics, science, social studies, and the humanities. No Child Left Behind has increased our national focus on testing, but even with the development of new and purportedly culture-fair instruments, many potentially gifted students continue to be overlooked. These students deserve instructional emphasis that fulfills their potential. This book provides information on numerous assessment instruments designed to screen, identify, and evaluate pre-K–12th grade students. Of particular interest are those instruments that assess students in academic, intellectual, creative, artistic, and leadership domains. 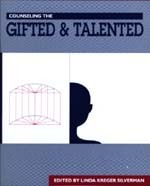 This book includes information on norming data, technical data, appropriateness for use with gifted and talented students, and publication information within a comprehensive inventory of relevant information for each test profiled. 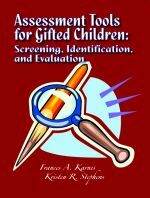 Assessment Tools for Gifted Children is an essential reference for all professionals working with gifted children.